UC Davis (Sacramento), March 9, 2013 – Researchers at this University of California campus have announced plans to develop a clinical trial where they would infuse adult human stem cells into the tongues of a small set of swallowing impaired patients by Christmas day 2014. Although stem cells have been used successfully in the treatment and repair of other human organs and tissue, this will be the first step in a process to strengthen and restore a vital part of one’s swallowing function. This initiative is being lead by physician Peter Belafsky PhD, a clinician and researcher at UCD, Jan Nolta PhD, stem cell lab Director and world renowned stem cell researcher, and Gerhard Bauer, the Director of the UC Davis Good Manufacturing Practice (GMP) facility. All members of this team are faculty members on the UC Davis campus. The National Foundation of Swallowing Disorders (NFOSD) had the privilege of interviewing this team on January 29, 2013. Following are the highlights from this meeting in a Question and Answer format. Q. Let’s start with some basics, what are adult stem cells and how do they differ from embryonic stem cells? 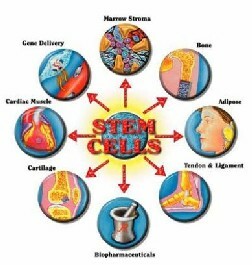 Adult stem cells cannot create an entire tissue “from scratch”, as can the embryonic stem cells. Adult stem cells are more specialized in their functions and can help heal damaged tissues. Myoblasts, for instance, are adult stem cells that are the muscle building cells. They become a part of the regenerating muscle. We also use “mesenchymal stem cells” isolated from the fat tissue of the patient. We call these cells the “paramedics of the body” since they promote revascularization of damaged tissues, reverse fibrosis, and can guide neural growth and repair. Q. Globally, how have adult stem cells been used in other human trials? In which of these trials did UCD participate? Please describe highlights in patient outcomes. There have been literally hundreds of clinical trials using adult type stem cells. Most of the time, adult stem cells are isolated from a patient, manipulated in the laboratory and returned to the same patient; such procedures are called “autologous” stem cell therapies. Our group has participated in many adult stem cell clinical trials. One recent trial, which was originated at UC Davis, is applying bone marrow stem cells to treat patients with blindness. Bone marrow stem cells are isolated from an enrolled patient’s bone marrow aspirate in the UC Davis GMP facility under highly controlled conditions, quality control tests are performed on the isolated cells, and then the cells are injected into the eye of the patient. Two patients have already been treated, with the first patient already showing signs of improved vision. Q. What role does the FDA have in adult stem cell trials of this type? The FDA needs to be involved from the very beginning. There are several phases of clinical trials. A Phase I clinical trial is a safety trial, a Phase II clinical trial is a safety and efficacy trial, and a Phase III clinical trial is an expanded safety and efficacy trial. No clinical trial on a new drug can be performed without the approval of such a trial by the FDA. Cells are considered “cellular drugs”. It is important that the FDA oversees and approves such trials since this assures that proper safety measures have been put in place to protect patients and that any efficacy of the new therapy will be measured in an appropriate fashion. The first step will always be to test the safety of a new therapy. With our recent cellular therapy for blindness, we at UC Davis had to prepare an investigator initiated “Investigational New Drug” (IND) application and get it approved by the FDA. We are currently holding the only stem cell IND for a Phase I clinical trial in the US to treat blindness. Q. In patient trials, where will the stem cells be harvested? We would get the myoblasts from a small muscle sample from the patient, and the mesenchymal stem cells can be grown from the patients’ own fat. So the cells would be the patients’ own cells harvested from a small incision in the neck or thigh. Q. Briefly describe the key milestones in a trial of this type? This is primarily a safety trial since it would be the first of its kind. So ensuring safety of the approach is the primary endpoint. But Dr. Belafsky and his staff will look for improvement as well – this is called the secondary endpoint. They will look for survival of the cells, and also for tertiary improvement in swallowing, using several advanced methods that are routinely used in their clinic. Q. What patient traits will you be evaluating when selecting ideal candidate trial participants? Patients who would qualify for the clinical trial would need to have a weakened or fibrotic tongue. The weakness could be caused by radiation therapy, surgery, or possibly neurologic disease. Nerve supply to the tongue would need to be intact to qualify for enrollment. Q. The swallowing function is one of the most complex neuromuscular processes in the human body. What role does the tongue play in this process? The tongue provides the driving force and helps initiate the swallowing process. It prepares a food bolus in the mouth and helps guide it safely past the larynx (voice box) into the esophagus. Q. Help set expectations and describe briefly the primary objective end points in measuring the success of this trial? The primary endpoint for the clinical trial is patient safety. We do not expect there to be much risk from stem cell injection into the tongue but there are theoretical risks that need to be excluded. The secondary endpoint will be survival of the stem cells in the tongue. A post-injection biopsy will be performed and specialized stains can be used to identify living autologous myoblasts. Tertiary endpoints will include improvements in speech (dysarthria rating scale) and swallowing (videofluoroscopy and manometry). Although preliminary experiments in the lab suggest that we can improve tongue strength, we are uncertain that we can improve a patients’ ability to swallow safely and overcome years of injury caused by progressive disease. Q. Trials of this sort are expensive. What funding is required and what are your expectations as to funding sources? We will need $40,000 to see this project through to completion. UC Davis scientists have volunteered to donate their own time outside of work to the project. The vast majority of the funds used will be for the reagents (drugs) needed to grow the stem cells. The money required to get this trial off the ground is very small compared to a typical FDA approved study. 20% of the funding for this trial has been raised. Help is needed in rasing the remaining funds to see the trial through to completion. Q. Can you describe the UC Davis Stem Cell Lab (origin, size, staff members, etc)? The GMP laboratory at UC Davis Medical Center is a multi-use, 6 manufacturing suite, Class 10,000 laminar air flow clean room facility. Not only can it be used for the manufacturing of cellular products under Good Manufacturing Practice and Good Tissue Practice, it is also compliant with USP 797 regulations and can be used for the manufacturing of other therapeutics for clinical use. All 6 manufacturing rooms are independent of each other, 6 different products can be manufactured without interfering with each other. Each room has its own air handling unit, redundant main air handlers are employed for make-up and return air. Multiple power back-ups including emergency generators prevent power loss. The manufacturing, entry and exit areas are separated by air pressure gradients. Validated, switchable room pressurization allows for the manufacturing of aerosolizable products such as gene therapy vectors in pressure sink manufacturing rooms. An elaborate interlock system controls opening and closing of access doors, which avoids cross-contamination of products by air turbulences. The GMP facility features an electronically controlled and automatically monitored environment, with additional 7 day per week manual monitoring, controlling and verifying the automatic monitoring. A strict QC/QA program with environmental cleaning and monitoring procedures is in place to assure freedom from microbiological contamination. Additionally, a GMP QC laboratory is associated with the UC Davis GMP facility, which provides QC assays such as USP 14 day sterility, LAL endotoxin assay, gram stain and viability dye exclusion assay for release testing. If interested in additional details on this trial or ways to help fund this effort, please contact Ed Steger at Ed@NFOSD.com. SLPs… Just Want to Have Fun! View Amazing Laryngeal Karaoke Video.